This painting is a quite a bit unique in my body of work. I saw an old black and white image of a zoo lion looking up at a light and was inspired by the lion’s powerful pose as well as the feeling of submissiveness and innocence in his eyes. I saw a great deal of symbolism that I just had to rush and paint. The Bible refers to Christ symbolically as the Lion of the Tribe of Judah. It represents His power, majesty, and everlasting kingdom reign. Just imagine how the omnipotent King Of Kings and Lion of Judah endured the greatest anguish ever recorded in history in the Garden of Gethsemane. In complete humility and knowing that he was about to die a horrible death for the sins of all mankind, He did not do His own will, but instead did the will of His Father in Heaven. Imagine how hard it was to obey… but yet he did it and triumphed! 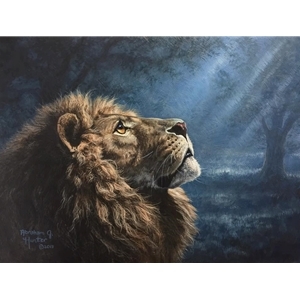 In this painting, a beautiful, bold, kingly lion looks to heaven at the light in submission to the next command he receives from his master. The background is reminiscent of Gethsemane. We are all striving to be more like Christ. We enjoy the strength and promise and power that we have in Him, but are we always humble like Jesus was? Do we do exactly what he commands? Even when everything in us wants to run away?